I first came across Tishani Doshi in an issue of Vogue India, where she did a feature on wearing pink. I read the feature, looked at her beautiful face, checked out the clothes she wore, and moved on to the next page—not much of a first encounter. Recently, I came across her debut novel, The Pleasure Seekers, and it bowled me over. She isn’t just another of those young Indians claiming to be a writer—her work deserves applause. Her easy, but lyrical, writing style is ensuring that her novel is flying off bookshelves around the country. Besides, you know a writer is good when her fan list includes a certain Salman Rushdie. 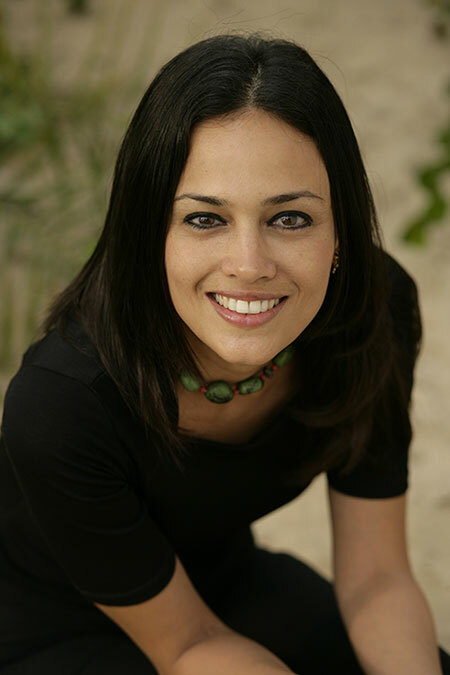 Author Tishani Doshi. Photograph by Denzil Sequeira. Tishani has worn many hats —writer, traveller, and dancer. She spoke to us about seductive India, dancing with Chandralekha, travelling to Ethiopia, and what inspires her writing. How have your early years shaped what you are today? I think part of being a writer must begin somewhere during childhood, when you’re learning ways of seeing and understanding the world. My childhood was incredibly sheltered on so many levels—I went to the same school from when I was three till I was 18; I have a very close-knit, loving family. Also, Madras was such a sleepy town then—very non-threatening and welcoming. I do remember being a very fearful child, though. Despite all the privilege and stability, I always had the sense of lurking fears. [It had] Partly to do with being over-imaginative, but also with the fact that I have a younger brother with Down Syndrome, which, as a child, was a very confusing thing to deal with—plus being the product of two cultures, etc. All combined, I think it made me very sensitive, and certainly shaped me into what I am today. You stayed in London for a while and worked with Harpers & Queen. What was the experience like and what brought you back to India? I went to London after spending five years in America, so I never really studied there, just worked. I guess I was “done” with America and not yet ready for home. London was the midway point. It was very exciting. I’d never lived in a properly cosmopolitan city before, and it was the perfect take-off point for travel—which I did a lot of—but I never really figured out how to deal with the bleakness of the English winters; the lack of light, the unending greyness. In the end, disillusioned with the fragmentary nature of that cosmopolitan life I was so enamoured with, I was seduced back to India with the simple promises of easily available idlis and never-ending sun. How did Countries of the Body happen? It happened slowly, very slowly, as things do in the poetry world. I had worked on a manuscript as a grad student at Johns Hopkins in 1999. In 2001, a reworked version of that manuscript won an Eric Gregory Award. I finally abandoned all those poems, and in 2006, Countries was published by Aark Arts and went on to win the Forward Prize for Best First Collection. Was it hard to find a publisher for your first book? How easy or difficult do you think it is for new writers to be published in India? I think it’s much easier now to approach publishers in India. Ten years ago, you wouldn’t know where to send something, and if you did, you would probably not even get an acknowledgment. I know I mailed out many manuscripts, which landed in some kind of publishing abyss. But the last few years have really seen a revolution in the publishing industry. I think this is a time when there are so many avenues available to the writer. Has it made being a writer any easier? No! Poetry in motion. Photograph by Wolfgang Kirchner. The Pleasure Seekers released recently. What made you choose to tell Babo’s and his family’s story? It was a story that was available to me, I suppose, and one that I needed to write for myself. I wanted to write a reinvention of my own family history, partly because so much of it was obscured to me, and partly because what little I knew of it made for really good storytelling. I began with the idea of telling a love story—the idealised love between Babo and Sian—but it slowly began to encompass many different love stories—the love between sisters, the love in families, wayward love, unconditional love, misguided love—all the different manifestations of love. And it also became a story about trying to understand home and family, and how those things fit into these different kinds of love. How different is writing poetry from writing a novel? The novel is essentially a much more ambitious venture. I think you need to have a lot of determination to attempt a novel—to see the entire thing in your head. Poetry for me is more a concern of the immediate—it’s distillation as opposed to expansion, but it doesn’t mean it’s simpler. After finishing The Pleasure Seekers, I immediately veered back to the world of poems, and it was such a relief because each poem is a containable thing—you don’t really need to see a poem in context to a collection until much later. With a novel, though, from the very first sentence, you’re aware that this thing has to be one sustained effort. What importance do you think poetry holds in today’s society? Does it get the appreciation it deserves? I have never understood why the novel reigns supreme in this literary age. I would have thought that the way people live now, with increasingly reduced attention spans and time for reading, that the short story or poetry would be more successful. But it isn’t the case. I think the main problem with poetry is that our first introduction to it—usually at school—is designed to put us off for life. Perhaps if we were taught contemporary poetry, if the language and the subject matter were more accessible, people would realise what terrific power a single poem can hold. Do you think it’s important for writers to convey messages through their work? Does art have to be for a cause? Not at all. I think approaching art with the idea of conveying a particular message or trying to be socially responsible is basically tantamount to propaganda. If you have strong alignments, whether it’s a particular philosophy or political bent, it will come through in your work. You don’t need to be didactic about it. What was it like to dance with Chandralekha? And what importance does dancing hold in your life? I have talked so much about this recently that I feel I can’t say anymore about it! Yes, I do still dance, it’s a great source of beauty in my life, as was working with Chandra. She remains the most remarkable person I’ve ever met. I was utterly in love with her on many levels, and the years I spent with her weren’t just fulfilling, they altered perceptions, and changed the very direction of my life. If I hadn’t found dance, I think I would feel completely un-centred. I dream a lot. I’ve basically engineered my life so that I have lots of spare time. The most recent dream is an idea for an artist’s retreat on the beach midway between Madras and Pondicherry. I want to create a space where friends can come and work on painting, sculpture, poems, whatever. It’s taking a while to complete, but it will happen soon. Also high on my list of things to do in my spare time is to learn to cook, and a foreign language, preferably Italian. The Pleasure Seekers book cover; courtesy of Penguin Books India. Which writers have influenced your work or have inspired you to write? A great many writers from Rilke to Toni Morrison have inspired me, but if I have to say what really inspires me to write, it’s probably music. I think music is the most powerful art form, and if I had any talent in that department I’d much prefer playing an instrument or singing. Given that my musical talents are limited, I try to achieve some sense of music in poetry and fiction. Yes. Many. Alice’s Adventures in Wonderland has long been a favourite. You call yourself a wanderer. How does travelling contribute to the way you live? Yes, I do wander a lot. I think it’s because I need to have alternating periods of moving and keeping still. Also, I like to be the outsider. I think it’s a position that comes easily to the writer. Which has been your favourite holiday? One of my most memorable trips was to Ethiopia. I went walking in the Bale Mountains with my best friend from college. She was Ethiopian, so I got to see the country through her eyes. What a spectacular country it is, despite the divisive politics, the poverty. The people are so proud, so breathtakingly beautiful. And those mountains—I’ve never seen anything like them in the world. You had a cricket blog, you are collaborating with Muttiah Muralitharan on his biography—what attracts you to cricket? I haven’t actually watched any cricket since I wrote the cricket blog for Cricinfo. I think it was probably cricket overdose! I used to watch cricket with my father, and as a child, it seemed to me a very graceful, gentlemanly game. When I returned to India after many years, cricket was one of the ways of reconnecting to the country and its obsessions. There’s something very beautiful about watching any sport, learning the intricacies, the movements, the limitations, but I have to say, as far as cricket is concerned, the sheen has slightly worn off. It’s vastly corporatised now and there’s altogether too much of it. I can’t keep up. I’m working on a second collection of poems. So, for the moment, I’m back in the world of poems, and it’s a good place to be. Poetry in motion ! What a wonderful way to describe this remarkable woman !! !